Army Spc. 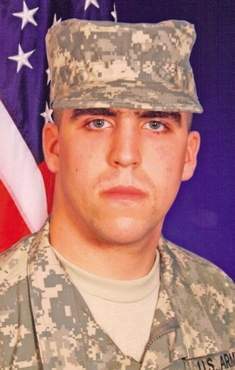 Nicholas Bernier - Run for the Fallen New Hampshire, Inc.
21, of East Kingston, NH; killed in action when insurgents attacked his unit using small-arms fire in Kherwar, Afghanistan. Paul Bernier knew his son Nicholas was destined to help other people from a very young age. There was always something about the way he treated others that led Paul to believe his son cared more about others than himself. "He was always a compassionate person," his father said. "He would bend over backwards for anyone in need." Nick was a 2007 Exeter High School graduate. He joined the Army in March 2008 and was a combat medic. He had an EMT license and upon completion of his military service was prepared to work as a paramedic for police, fire or a hospital. Ultimately, he had wanted to become a vascular surgeon. It was Nick’s need to help others that led him to a military career; a career family says he loved every day, until his last day. He loved medicine and he loved taking care of people. He died June 25 at Landstuhl Regional Medical Center in Germany from injuries suffered June 22, when insurgents attacked his unit using small-arms fire in Kherwar, Afghanistan. Both of Nicholas Bernier's parents, Paul Bernier and Tina Wilcox, also served in the Army. Lt. Col. Christopher Ramsey, battalion commander of 2nd Bn., 30th Inf. 's Task Force Storm, said Nicholas died augmenting force protection and providing medical attention to other wounded soldiers. Nick took care of people on a daily basis when he was based at Fort Sam Houston, TX.. He took pride in his job. His father recalls that his pride always showed through when the two of them would talk. "He knew he made the right career choice," his father said. Sgt. Carleton Thrall, officer and friend of Nick’s at Fort Sam Houston met Bernier - or Bernie, as they affectionately called him before Nick volunteered for an assignment with 4th BCT at Fort Polk. "I thought to myself, I need to find out why on God's Earth this kid would want to leave Fort Sam Houston and go to Fort Polk," Thrall said. "His response: 'I don't want to ride around in an armored coffin with the cav (cavalry), and I like my knees the way they are, so the Airborne is out; and, I'd like to see the infantry.'" 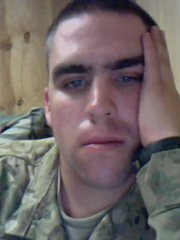 Nick deployed with his unit from Fort Polk, LA., in October 2010 to Afghanistan in support of Operation Enduring Freedom. He was handpicked for the mission because of his experience as a medic. His cousin, Renee Bernier, recalled a conversation she had with Nick. Even as he was in the middle of his mission and in harm's way each day, he still took time to listen about her life and challenges in college, she said. "He listened so intently because Nick cared. He cared about my silly problems," she said. "Because he was one of the most compassionate people I knew." He even sent her a poem about staying strong when facing life's challenges. Renee later presented family and friends with key chains she made as a way to connect all of them together. The key chains had different colors on them, all symbolic to Nicholas Bernier in some way, such as yellow for his spirit and blue for the sky and his eyes. "Every clear day when you look up at the sky, know he's looking back at you with his bright blue eyes," she said. Nick's family was awarded the Bronze Star Medal at his funeral service. He was described as the type of soldier "you wanted on your team when in harm's way." 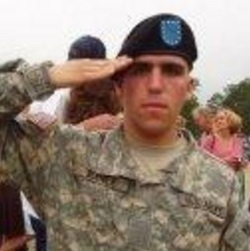 Nick joined the Army in March 2008. After training at Fort Benning, Georgia, he was assigned to Fort Sam Houston, Texas in May 2008. He arrived at Fort Polk, Louisiana in April 2010 and deployed with his unit in October 2010 to Afghanistan in support of Operation Enduring Freedom. Donations can be made to the Fisher House Foundation fund. This non -profit organization makes it possible for families to be with their wounded soldiers. http://www.fisherhouse.org/donate/gifts-and-memorials/. His awards and decorations include the Bronze Star, the Purple Heart, the Army Achievement Medal, the Army Good Conduct Medal, the National Defense Service Medal, the Afghanistan Campaign Medal with campaign star, the Global War on Terrorism Service Medal, the Army Service Ribbon, the Overseas Service Ribbon, the NATO Medal, the Combat Medic Badge and the Driver and Mechanic Badge. Nick is survived by his father, Paul W. Bernier; mother and step-father, Tina and Jeffrey M. Clements; sister, Brittany May; brothers, Bradley and Christopher Bernier and his extended family. LOGAR PROVINCE, Afghanistan — Spc. Nicholas P. Bernier's leaders and comrades gathered to honor him as a positive-thinker and a true warrior, hero and friend, on Forward Operating Base Altimur, Afghanistan on July 4. Bernier was a 21-year-old combat medic from East Kingston, N.H. assigned to Company D, 2nd Battalion, 30th Infantry Regiment, 4th Brigade Combat Team, 10th Mountain Division. In the presence of his family, Bernier died June 28 in Landstuhl, Germany, from wounds suffered during an enemy engagement at Combat Outpost Kherwar in Logar Province, Afghanistan, June 22. Lt. Col. Christopher Ramsey, battalion commander of 2nd Bn., 30th Inf. 's Task Force Storm, said Bernier died augmenting force protection and providing medical attention to other wounded Soldiers. "Nick is an American hero, and we will remember him that way," Ramsey said. "Nick was an outstanding Soldier, a great teammate and a loving son. He will be missed by all those who served with and cared for him." Ramsey said Bernier was an extremely competent and natural-born leader who was mature beyond his years and fulfilled his responsibilities in a quiet and professional manner. Bernier always succeeded at every task laid before him, he said. "Nick was the epitome of a combat medic. He was handpicked by his leadership to perform these duties in Kherwar," Ramsey said. "The forces needed someone who was competent, a self-starter, able to operate with minimal guidance, could take on other roles and responsibilities as directed and could operate in chaotic situations without it affecting his performance." Ramsey said Bernier was the obvious choice for the job. Bernier always went above and beyond the call of duty, rarely needed to be told what to do and was not only dedicated to his job but also committed to excellence, he said. "Our unit motto is 'Our Country, Not Ourselves.' I think that is probably the best motto in the Army," Ramsey said. "Nicholas Bernier epitomized our unit motto, and this was not something he learned in the Army; it was from the soldiers he served with ... good upbringing and his desire to make a difference." Capt. Bixler Benson, commander of TF Storm's Headquarters and Headquarters Company, said Bernier did not question or complain when he received the news about going to Kherwar to support and provide security for forces there. He said Bernier was a soldier who not only understood but also embraced the "Warrior Ethos." "Specialist Nicholas P. Bernier has earned the honor, and our pride, as a warrior," Benson said. "His name is added to the ranks of our heroes who have made the ultimate sacrifice. He has sacrificed his life defending his brothers and sisters who stood at his side. He is my hero. Nicholas was a medic by duty, but he was a warrior first. "Benson said he would always remember Bernier's humor and positive attitude. He recalled a special moment when Bernier performed an impromptu, a cappella rendition of a song entitled "The Safety Dance" during a mission readiness exercise. "It was complete with a dance routine. It had the entire aid station (and me) rolling on the floor with laugher," Benson said. "This was exactly what we needed .... Nicholas always knew what we needed. He always gave every mission task everything he had. Today we honor Nicholas Bernier's life. We thank him for standing next to us, and we grieve for our brother and friend. Well done. Be thou at rest - 'Our Country, Not Ourselves.'" Sgt. Carleton Thrall is a medical treatment non-commissioned officer for TF Storm's HHC who is attached to Co C. Thrall said he met Bernier - or Bernie, as Thrall and other comrades affectionately called him - at Fort Sam Houston, Texas, before Bernier volunteered for an assignment with 4th BCT, 10th Mtn. Div. at Fort Polk. "I thought to myself, I need to find out why on God's Earth this kid would want to leave Fort Sam Houston and go to Fort Polk," Thrall said. "His response: 'I don't want to ride around in an armored coffin with the cav (cavalry), and I like my knees the way they are, so the Airborne is out; and, I'd like to see the infantry. '"Thrall said Bernier proved to be one of the hardest working soldiers and the single most positive man he ever met. Bernier never had a bad thing to say about anyone and couldn't conceive of making fun of people, he said. Bernier had a lot of friends in his platoon because he knew how to be a friend and how to listen, and people listened to him, he said. "I miss you," Thrall said, speaking to Bernier. "I am grateful you came downrange with me. You knew what you were getting into, and you did well. I am forever proud." Spc. Sean Monk, a combat medic assigned to TF Storm's Co D, said Bernier was a good soldier who would do anything asked of him without any complaints. Monk explained the significance he assigns to July 4, calling it "our country's most revered holiday," and how it applies to honor his fallen friend. "Today is the day we remember those who fought for the freedoms and independence that are forged in every American," Monk said. "Today we gather as a family, brothers and sisters in arms, to honor one of our own who served, fought and gave his life so others may have those same liberties and freedoms. I am honored to stand here today; and, on behalf of all the junior medics, I would like to express how deeply Bernie will be missed. He was a friend, a brother and, most of all, an American hero." Bernier's awards and decorations include the following: Bronze Star Medal; Purple Heart Medal; Army Achievement Medal; Army Good Conduct Medal; National Defense Service Medal; Afghan Campaign Medal, with campaign star; Global War on Terror Service Medal; Army Service Ribbon;Overseas Service Ribbon; NATO Medal; Combat Medical Badge; Driver and Mechanic Badge, Wheeled Vehicles.